Over the last few months, we have been working on improving accessibility for all Wijmo controls, especially the FlexGrid. And we are happy to report that the latest version of the FlexGrid is not only one of the fastest and most full-featured grids on the market, but is also one of the most accessible. What is ARIA and why is it important? If you are new to ARIA, I strongly recommend Marco Zehe’s accessibility blog, and especially his What is WAI-ARIA. In short, ARIA is a technology that makes advanced Web applications accessible and usable to people with disabilities. It is based on a standard set of attributes added to HTML elements to provide a framework for describing features for user interaction, and how assistive technologies can use this framework. These attributes extend the stable HTML specification to provide the extensibility and flexibility required by emerging technologies and standards. When we first released Wijmo 5, back in 2014, the WAI-ARIA 1.0 standard was about to be published, and few assistive tools supported it. Fortunately, that situation has changed. WAI-ARIA is becoming well-supported and better understood. Coincidentally, we recently started to get lots of requests from important customers with dedicated accessibility teams who were willing to work with us to improve the Wijmo controls and make them accessible. This article describes the work we did, which went far beyond adding a few ARIA attributes to the controls. Interestingly, the folks at Facebook faced the same challenges when implementing ARIA-compliant grid elements. Their work is described the ARIA Grid: Supporting nonvisual layout and keyboard traversal document, which contains tons of useful, practical information about ARIA and assistive technologies. ARIA attributes are important because they offer a standard way to provide accessibility tools with information about the role and state of generic HTML elements such as “divs”. This presented a problem for us because the FlexGrid is composed of panels (topLeft, columnHeaders, rowHeaders, cells, etc). Plus, the FlexGrid did not even have “row” elements. Cell elements were direct children of the panels. Adding invisible cells to the “cells” panel to represent column and row headers. These invisible cells are seen and reported by screen readers and accessibility tools. The new version of the grid has more HTML elements than previous ones, but performance is better in many cases because it is easier to reorder rows than cells while scrolling vertically. Also, the new row elements provide more control over styling, since the row elements can be used in CSS selectors. The FlexGrid addresses this issue by creating an extra invisible row at the top of the grid. This invisible row contains the column headers, in elements with the “columnheader” role. The content of the column header cells is taken from the “header” property of the grid’s columns. The FlexGrid also provides a “rowHeaderPath” property that allows you to specify a binding that will be used to provide row header information. If this property is set to a non-null value, the grid will create an extra invisible column with the “rowheader” role. This is important because in most applications, the first column does not contain information suitable to be used as row headers. And even if it did, the grid virtualizes cells so the first visible cell in a row may not correspond to the first bound column. The FlexGrid used to render frozen cells after regular cells. This was done to ensure they displayed ‘above’ regular cells. Unfortunately, that meant screen readers would ‘see’ the cells in the wrong order, which was confusing for users with accessibility needs. We addressed this problem by rendering the cells in the natural order, and using the ‘z-index’ style attribute to show the frozen cells above regular ones. This change made the code and the DOM simpler, at the expense of some additional styling. Most importantly, it made screen readers work properly on grids with frozen cells. The FlexGrid uses Microsoft Excel as a model for many of its operations, including keyboard handling. Control+UP/DOWN:The FlexGrid used these keys to move the selection to the first and last rows of the grid, like Excel does. But the control arrows are used extensively by accessibility tools, so now the grid uses Alt+PAGEUP/DOWN to navigate to the first and last rows instead. Tab key: The FlexGrid used these keys to cycle through the cells, like Excel does. But this interferes with the default browser behavior, which is to move the focus to the next/previous focusable elements. We decided to change the default behavior and let the browser handle the focus, but added a keyActionTab property so users can revert to the Excel behavior if they prefer to do that. We also added a keyActionEnter property that allows users to customize the behavior of the Enter key. The other keyboard commands used by the FlexGrid follow the ARIA recommendations and are largely compatible with Excel. Delete the currently selected rows (if the allowDelete property is set to true), or clear the content of the selected cells (if the values are not required). * Modified in the latest version to improve accessibility. The FlexGrid code avoids adding event handlers to child elements. Instead, most events listeners are attached to the grid’s host element, and forward the commands to the appropriate child elements based on hit-testing logic. This presents a problem in some accessibility scenarios that expect to be able to get references to child elements and fire events in code, by invoking the child element’s “click” method directly. In this case, the grid does receive the click event as usual, but without valid mouse coordinates and without “mousedown” and “mouseup” events before the click. You can follow the same approach to simulate clicks and select cells, expand/collapse nodes, drop down list boxes associated with cells, etc. Focus handling was by far the toughest challenge. In previous versions, the grid used a hidden element to grab the focus and prevent browsers from trying to scroll the entire grid into view. The selection was handled by the grid itself, independent from the focus. This approach made it impossible for assistive technologies to examine and navigate the grid, since they rely on getting or setting the document’s activeElement, expect focusable elements to have tabIndex values greater than -1, etc. We changed the grid to make sure the currently selected cell element does contain the focus, and it corresponds to the grid’s selection. If the grid has no selection, or if the selected cell is scrolled away from view, the grid falls back to use the original hidden element so the focus stays within the grid. As we said earlier, implementing accessibility requires a lot more than just adding some ARIA attributes to controls elements. We spent a lot of time testing FlexGrid’s accessibility support. We did not work alone on this. Some of our customers have accessibility teams who worked with us to fine-tune the accessibility features and test them with different assistive technologies. Their help was invaluable! These warnings are very useful when checking your apps for accessibility issues. There may be some false alarms, but the tool does catch many real issues. It’s a good idea to get into the habit of using the tool and learning how to avoid common problems. The accessibility audit is especially useful when you start adding ARIA attributes to your applications and components. It knows the WAI-ARIA 1.0 spec and will warn you about implementation errors. Narrator: Comes with Windows, works well with Internet Explorer and Microsoft Edge. 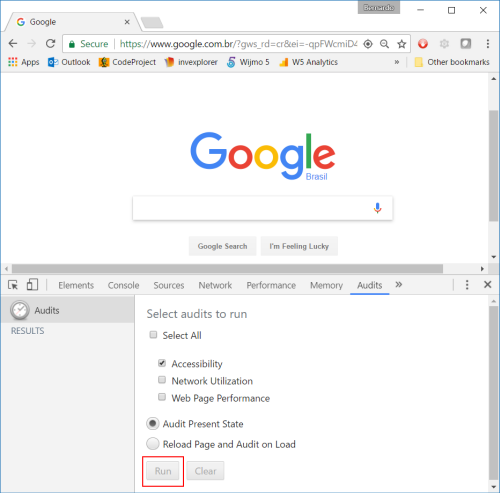 ChromeVox: Free and easy-to-use, works with Chrome. JAWS: The 'standard' for accessibility. It is popular and full-featured, and there is a free trial mode. NVDA: Free and is gaining popularity. The accessibility tools have commands for reading and navigating the elements on the page. But you will notice that not all grids provide the same level of accessibility support. We believe the FlexGrid is among the best, and will work to keep it that way.